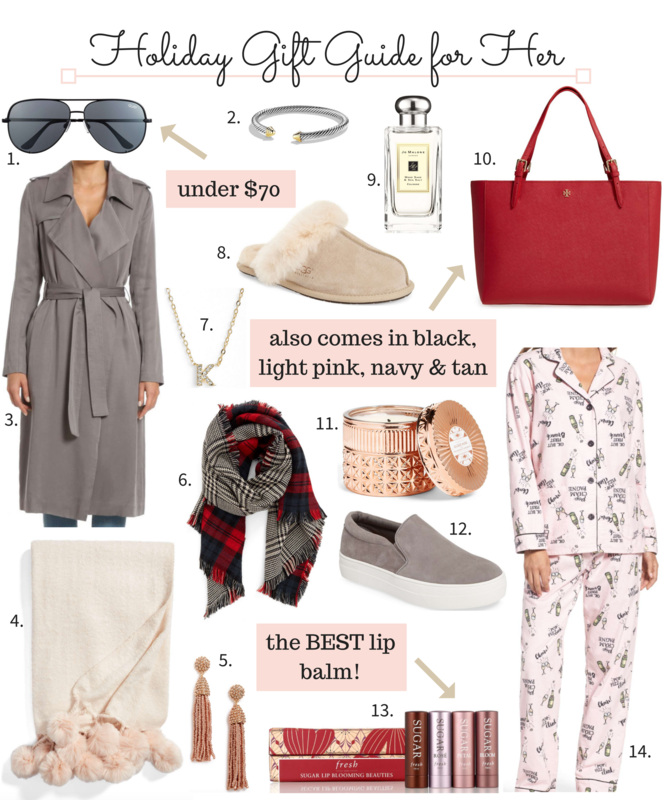 The holidays are quickly approaching and since I know that many of you have started your holiday shopping, I thought that it was time to start sharing holiday gift guides! I will be doing a lot of these types of posts so that you can find something for everyone on your list. All of the guides will be available under the Holiday tab at the top of my blog! Anyway, back to the Holiday Gift Guide for Her! When rounding up these items, I tried to stick to pieces that I either own or have my eyes on. While I love all these gifts, I think that this reversible scarf, this red tote, and this long trench coat are my favorites. As for beauty products, I’m thinking of doing a specific blog post. However, some of the products I recommend include this Sugar Lip Treatment set and this Wood Sage & Sea Salt cologne. I own both and use them often. If you’re looking for a cozy type of gift, then I suggest these P.J. Salvage pajamas and these slippers! You really can’t go wrong with any of these gifts! Since I plan to do more gift guides, let me know what types of guides you want to see. Gift guides for men? For your bff? For a hostess? I’d love to hear your thoughts. Also, don’t forget to check out my Thanksgiving outfit idea here.